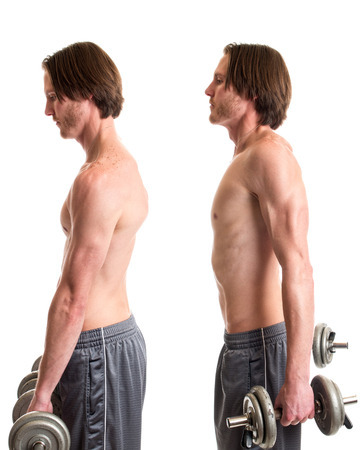 The top 10 back exercises for men target each muscle group from your neck to your hips. When designing your back routine, aim to include a variety of back exercises for men that will give you the wings you want, plus improve your posture, reduce back pain and enhance core strength. The top 10 back exercises not only focus on strength, but also on your overall health and safety. For your next back workout, select two or three of the following back exercises and rotate through the list as you progress with your weekly workout sessions. Perform one to three sets of eight to 12 repetitions using a weight load that causes the last two repetitions of each set to be challenging. Warm your muscles prior to your sessions and cool down at the end of your workout. Wear workout gloves to protect your hands from rough handles and to reduce your risk of calluses and small tears in your hands. Grasp a pull-up bar with your hands slightly wider than your shoulders and with your palms facing away from you. Hang from the bar with your back straight and knees underneath your hips. Exhale, bend your elbows and pull up your body until your chin is near the height of your hands. Inhale, slowly straighten your arms and return to the starting position. This exercise targets the Lats. Stand with your feet slightly wider than your hips. Hold a barbell with your gloved palms facing you and your arms straight along the front of your body. Position your hands shoulder-distance apart. Exhale, shrug your shoulders by raising them toward your ears. Inhale, lower your shoulders as far as possible. You can also hold onto a Smith bar or with a dumbbell in each hand. This exercise targets the Trapezius. Lie face down on the hyperextension bench with your hip bones just beyond the pad. Position the backs of your ankles against the roller pads. Hold a weight plate against your chest with both hands. Inhale, bend forward as far as possible to feel a stretch in your back. Exhale, raise your torso until your body is parallel with the floor or slightly beyond a parallel position. This exercise targets the Erector Spinae. Stand tall with your core engaged and your feet slightly wider than hips-distance apart. Bend your knees slightly. Grasp a barbell with both hands facing you. Keeping your core tight, fold forward from your waist as you press your hips behind you. Hang your arms straight down from your shoulders. Exhale, bend both elbows and bring the barbell toward your navel. Point your elbows out to the sides to keep them in line with your wrists. Inhale and straighten your arms to the starting position. This exercise targets the overall back. Attach a pull-down bar to a top cable. Grab the bar slightly beyond the bends on each side. Sit with your back straight and feet flat on the floor. Lean back slightly and as you exhale, bend your elbows and pull the bar down to the top of your chest. Concentrate on driving your elbows down toward your sides. Pause for one second and then inhale as you slowly return to an extended arm position. This exercise targets the Lats. Attach a two-handled, parallel bar handle to the top cable. Hold onto the handles with your palms facing each other. Sit with your torso tall and feet on the floor. Slightly lean back as you exhale and pull the handle to your chest. Inhale and extend your arms to the start position. This exercise targets the Lats with more concentration on the Rhomboids than the wide-grip pull-down. Lower the bar of a Smith machine to a height that is just out of reach when you lie face up on the floor beneath it. Position your body under the bar so that it is horizontal across your chest. Straighten your legs and rest your heels on the floor. Grasp the bar with your hands wider than your shoulders and your palms facing your feet. Exhale, bend your elbows, and pull your body toward the bar. Inhale, straighten your arms and extend them fully. To increase the challenge, raise the bar higher and rest your heels on a flat bench. This exercise targets the overall back. Kneel in front of a flat bench. Position your chest across the bench so your shoulders are slightly beyond the side of the bench. Hold onto a weight plate with both hands behind your head. Exhale and raise your head as high as comfortable. Inhale and lower your chin toward your chest. This exercise targets the Splenius in your neck and your upper back. Position your upper back perpendicular to a flat bench. Bend your knees to raise your hips and place your feet flat on the floor. Your head is also supported by the flat bench. Hold onto a barbell or an EZ-curl bar with both hands. Extend your arms over your chest with your palms facing your feet. Inhale, keep your arms straight, with only a slight bend in your elbows, as you lower the barbell over your head as far as comfortable. Exhale, return the bar to the starting position. This exercise targets the Lats. Load weight plates onto a T-Bar. Stand with your feet slightly wider than your hips. Bend forward while keeping your back straight and grasp the wide handles of the T-Bar so your palms are facing each other. Exhale, bend your elbows, and raise the bar toward your upper body. Inhale, straighten your arms, and slowly return the bar to the starting position. You can change the muscle focus by changing the grip. For instance, keep your gloves on and grasp the handles that are closer together to engage the Rhomboids. This exercise targets the overall back. The back contains a variety of muscle groups. The most common are the Trapezius and Latissimus Dorsi. While these two groups provide the best visual effects, the rest of your back needs attention too. When you strengthen the muscles in your neck, lower back and those along your spine, you improve your posture which makes you look more confident. When your back is strong, you also reduce your risk of back pain and injuries. During your workouts, gradually increase the weight load to protect yourself and be mindful of your workout form. If you use a weight load that is sacrificing form, decrease the weight until your muscles are safely able to lift the heavier weight load. Fuel your workouts with healthy foods and hydrate your muscles with water. Always allow for at least one day of rest between back workouts so you return to your next workout strong and without muscle soreness. Rest for one minute between sets to keep the workout challenging and effective. Wear appropriate shoes for support and protection and wear workout gloves to keep your hands free from blisters, calluses, and tears.